A lot of factors can increase your chances of seeing the Northern Lights in the Arctic. The most important? Be in the right place! The ethereal Northern Lights occur in the Arctic region and are most visible in a circular band known as the Aurora Borealis Oval Zone. Much like a wide oblong ring, the zone is centred on the magnetic North Pole which is currently located just off Ellesmere Island in north-eastern Canada, right by north-western Greenland. This shouldn’t be confused with the geographic North Pole which is at the northern end of our planet, just 1000km north of Spitzbergen. The most important thing to note is that the very best viewing of Aurora activity happens at the edge of the oval zone, not in the centre. This explains why, against all intuition, it is not enough to simply head north: one must be in specific areas of the Arctic if one hopes to see the amazing dancing lights of the north. The above map sheds a good light on the best regions which offer the greatest chances of seeing the Northern Lights and also highlights the fact that although the light-show covers an impressive land area in the Arctic, a lot of it is inaccessible rugged wilderness that’s hard to get to. Moreover, the map above is a little optimistic and wider than what the reality is, for various reasons. Here’s a screenshot from the forecast simulation on the Space Weather Prediction Centre website, taken at time of writing. You’ll notice a subtle discrepancy over northern Europe between the two graphics, with the Oval Zone shown above to occur further south than is depicted in the first graph. This explains primarily why Spitzbergen, the famous wildlife-watching destination of summer Arctic expeditions, does not see the most spectacular Northern Lights show in winter (it is a tad too far north) and why the lights are actually much more visible further south, in northern Scandinavia. 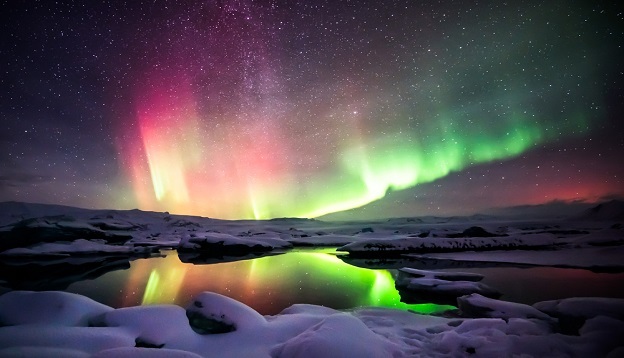 In recent years, southern Greenland and Iceland have put on phenomenal Northern Lights shows and this is expected to continue, despite the fact we are currently on the downward slope towards what is known as a Solar Minimum, with a Solar Maximum predicted to hit in 2025. Solar flare cycles, as they are known, have been shown to occur at 11-year cycles ever since scientists started keeping tabs. Counterintuitively, a Solar Minimum does not equate to less Aurora action: it simply means the ring is a tad narrower so one must be directly below the oval zone, for the next few years, to have a greater chance of spotting the lights. Other very popular but harder-to-reach places to see the Northern Lights are the Murmansk Kola Peninsula in north-western Russia, almost all of Alaska and the northern region of Canada. It’s fascinating to know that whilst the geographic North Pole doesn’t move much, the magnetic North Pole goes on extensive walkabouts every year, moving in a loop and then west, edging more towards Canada every year at an annual rate of about 10km. 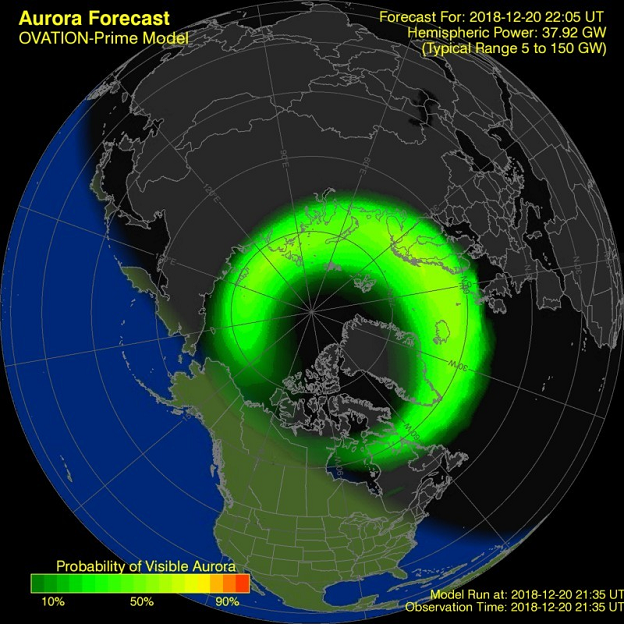 It may not seem like much, granted, but the movement has been shown to greatly affect Northern Lights activity. Catching the Northern Lights: Not Only About Location! Being in the right place is only part of the Northern Lights story, a few more prerequisites joining the party to ensure a successful sighting of the otherworldly dancing lights. As detailed in our guide to the Best Time to See the Northern Lights, you’ll need to time your visit to the Arctic to coincide with a period of the year that carries the least chance of extensive cloud cover and a decent number of night-time hours. Moreover, it pays to note that seeing the Northern Lights is only one aspect of expeditions to the Arctic: this incredible chasm of snow and ice is a spellbinding destination that offers visitors a tremendous array of unique experiences. Seeing the Aurora Borealis at work with your own eyes is a magnificent experience, there’s no denying that, but it should really be seen as an incredible bonus of an Arctic adventure, not the solitary reason to join one. For this reason, at Chimu Adventures, we offer sensational Northern Lights expeditions that run in September from the most exhilarating Arctic destination of all: Iceland. Heading off from Reykjavik, you can explore the magical fjords, glaciers and waterfalls of the country and, if you have more than a week to spare, head on up to meander the dramatic south-eastern coast of Greenland, where the Scoresby Sound – the largest fjord system on the planet – offers stunning options for adventures in one of the wildest and most arresting landscapes on earth. 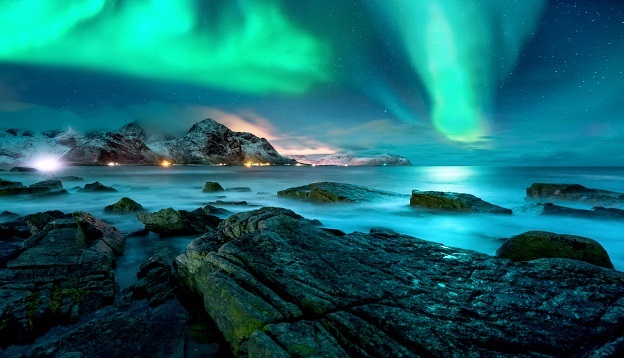 In our opinion, this region of the Arctic offers the most ideal compromise between daytime activities and night-time Northern Lights chasing, keeping you firmly underneath the Aurora Borealis Oval Zone for the highest chances of seeing the glorious dancing lights. Want to know more? Contact us, right here. This memorable voyage starts and finishes in Reykjavík, Iceland. Across the Denmark Strait we explore the stunning Scoresby Sund fjord complex in East Greenland. Here we discover unbelievable scenery, historical sites, massive icebergs, a contemporary Inuit village, and of course the mesmerizing northern lights.